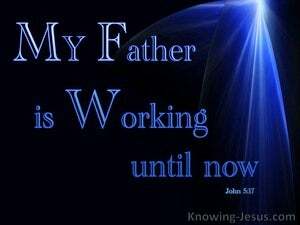 ﻿ John 5:17 But He answered them, "My Father is working until now, and I Myself am working." But He answered them, "My Father is working until now, and I Myself am working." But Jesus responded to them, "My Father is still working, and I am working also." But Jesus answered them, "My Father has been working until now, and I, too, am working." But Jesus answered them, My Father works until now and I work. But Jesus answered them, My Father worketh even until now, and I work. 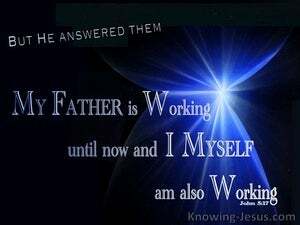 But Jesus answered them, My Father has worked [even] until now, [He has never ceased working; He is still working] and I, too, must be at [divine] work. But Jesus said to them, "My Father is continuing to work and I am working." But Jesus answered them: My Father works till now, and I also work. But his answer was: My Father is still working even now, and so I am working. But Jesus answered them, "My Father is working still, and I am working." But Jesus answered them, my father works without intermission, and so do I. But Jesus answered them, My Father worketh hitherto and I work. And He responded to them, My Father worketh until now, and I work. But he answered them, "My Father is still at work, and I work too." But Jesus answered them, My father worketh until now, and I work. But Jesus answered them, My Father works until now, and I work. And Jesus answered, My Father works till now, and I work. But Jesus answered them, My Father works still, and I work. But he answered them, "My Father is working until now, and I am working." And Jesus answered them, "My father worketh hitherto, and I work." The reply of Jesus was, "As my Father has continued working to this hour, so I work too." But he answered them, "My Father has continued working until now, and I am working too." So he told them, "My Father is working until now, and I too am working." But he answered them, "My Father is still working, so I am working, too." But he answered them, My Father is working up to this time, and I work. But Jesus answered them, My Father works even till now, and I work. But, he, answered them - My Father, until even now, is working; and, I, am working. Then Jesus answered them, My Father worketh hitherto, and I work. But Jesus replied: "My Father works to this very hour, and I work also." His reply to their accusation was, "My Father works unceasingly, and so do I." Then He answered them, "My Father is still working, and so am I." But Jesus answered them, "My Father is still working, so I am working, too." But He answered them, "My Father worketh even until now, and I work." But Jesus answered them, My Father worketh without intermission, and so do I. 16 For this reason the Jews were persecuting Jesus, because He was doing these things on the Sabbath. 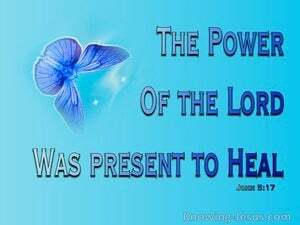 17 But He answered them, "My Father is working until now, and I Myself am working." 18 For this reason therefore the Jews were seeking all the more to kill Him, because He not only was breaking the Sabbath, but also was calling God His own Father, making Himself equal with God. "Do you not believe that I am in the Father, and the Father is in Me? The words that I say to you I do not speak on My own initiative, but the Father abiding in Me does His works.